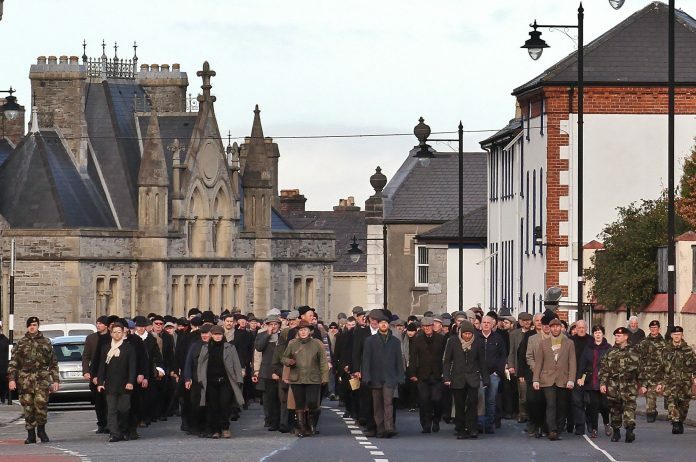 Sligo remembered those from the county who died in World War One with a dignified procession of more than 600 people and the turning of a sod for a new memorial garden on Sunday. An estimated 5,000 men from Sligo (or of immediate Sligo origin) fought in that war and war records research by local historian Simone Hickey shows 602 of these men lost their lives during the conflict or subsequently because of the injuries they suffered. Five civilians from County Sligo, including two women, also perished. They were aboard the mailboat, the RMS Leinster, which was sunk by a U-boat shortly after it left Dún Laoghaire (then known as Kingstown) on October 10, 1918. To recognise and acknowledge the loss of all 607 lives, Blue Raincoat Theatre Company decided to organise a large scale public arts participation event. And so on Sunday morning 607 people, men and women dressed mainly in civilian clothes representative of 1918 and each representing someone from Sligo who had died in the war, were lined up in formation by members of the army on Wine Street. Then at 11.11am (the time the Armistice came into effect on November 11, 1918) they moved off and walked from there by way of O’Connell Street, Grattan Street, Teeling Street, to the war memorial on Pearse Road, where a short ceremony, including reading of letters from soldiers, was held. Church bells throughout the county were also rung at the time. Later at a sod turning ceremony for a new World War One commemorative garden took place at Cleveragh Regional Park. The sod was turned by Cathaoirleach of Sligo County Council, Councillor Martin Baker. Prior to the sod turning, music was provided by the Sligo Concert Band and that was followed by a short ecumenical prayer and a poetry recital. At the end of the ceremony two pipers played a lament. The impact of what became known as the Great War on Sligo town and the county was huge with 28% percent of Sligo men of military age (18-40) signed up over the 2104-18 period. See this week’s Sligo Weekender newspaper for a two page spread on last Sunday’s events. In shops now!